At Tuesday’s press conference on Capitol Hill, Dr. Charles Bernick, associate director of the Cleveland Clinic Lou Ruvo Center for Brain Health, announced the Nevada State Athletic Commission will be adopting the “C3” test, which will track brain function in fighters. 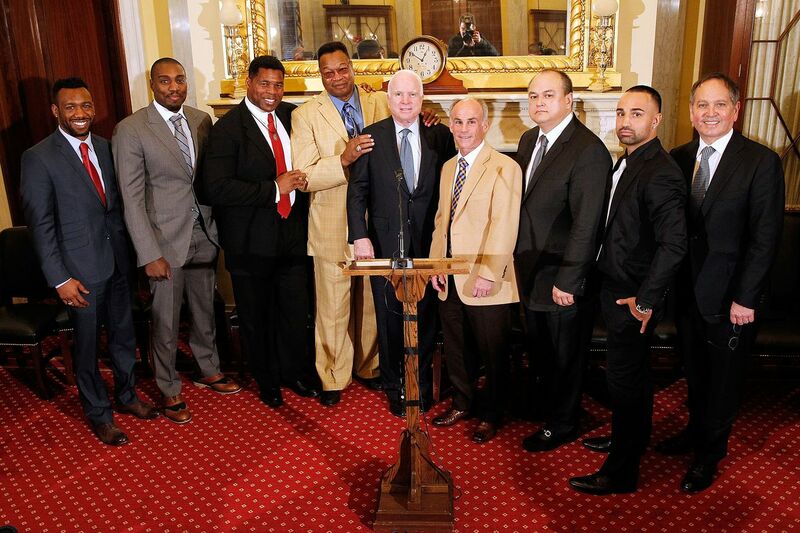 WASHINGTON–Representatives of Bellator MMA, Spike TV and several of the most popular names in combat sports joined Sen. John McCain and Dr. Charles Bernick, associate director of the Cleveland Clinic Lou Ruvo Center for Brain Health, Tuesday afternoon (April 26, 2016) on Capitol Hill for the announcement of a new measure of fighter safety regulation to be adopted by the Nevada State Athletic Commission (NSAC). McCain, the man who once referred to mixed martial arts (MMA) as “human cockfighting” back in its days of infancy, is a huge believer in the Cleveland Clinic’s intrepid research on brain health in combat sports and commended all who are involved with providing financial backing for the studies. Those include: Spike TV, Bellator MMA, UFC, Haymon Boxing and Top Rank. Spike president Kevin Kay, and Bellator MMA president Scott Coker were on hand to show their continued support and financial commitment to the Cleveland Clinic with the announcement of a two-year renewal, as was Bellator MMA light heavyweight Phil Davis. Retired boxing legend Larry Holmes, NFL great Hershel Walker, and boxers Austin Trout and Paul Malignaggi–who were there as representatives of Premier Boxing Champions–were also in attendance inside the Russell Senate office building for Tuesday’s press conference.